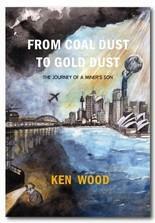 Ken published his first book, From Coal Dust to Gold Dust (The journey of a miner’s son) in December 2010. From Coal Dust to Gold Dust is the true story of a coal miner’s son who enters the world of corporate troubleshooting. An odyssey of international travel, culture and human behaviour where one’s spirit and values are tested to the full and life’s simple lessons are relearned.